Talisker is one of the most remote distilleries, lodged far from any neighbour in the small coastal community of Carbost at the head of Loch Harport. It was in 1825 that Hugh and Kenneth MacAskill came here from the smaller island of Eigg, first to bring sheep to Skye, leasing Macleod land at Carbost. 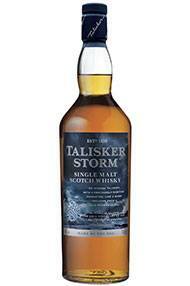 They built Talisker Distillery in 1830 against the fiery protestations of the former parish Minister, the Rev. Roderick Macleod, who declared this "one of the greatest curses that... could befall it or any other place”. Disaster struck the distillery in November 1960, which was then still coal-fired, when fire burned down the still-room. The distillery was rebuilt fastidiously around exact copies of the old stills. 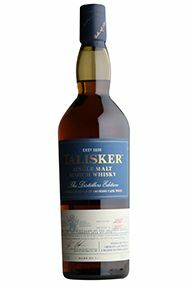 Today, Talisker is one of the single malts in Diageo’s portfolio since 1988. 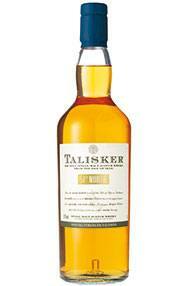 A great deal is marketed as single malt, but Talisker is a part of the Johnnie Walker and White Horse blends too. Powerful peat-smoke with sea-water saltiness, the liquor of fresh oysters, a citrus sweetness. Full-bodied, with a rich dried-fruit sweetness, clouds of smoke and strong barley-malt flavours, the palate is warming and intense. At the back of the mouth is an explosion of pepper. Huge, long, warming peppery finish with an appetising sweetness. Spicy, mellow smoke and a honeyed sweet maltiness with an explosion of pepper on the nose, this is a more robust, smokey version of the 10 year-old, released for the first time in 2010. On the palate, at first sweetly mellow and rich followed quickly by a spicy heat, like a gathering Storm. The flavour is elegantly drawn out with a balance of sweetness, smoke and salt. Highlighting the latitudinal position of the distillery - one of the most remote and northerly at its rugged home on the Isle of Skye, Talisker 57° North has no age statement. 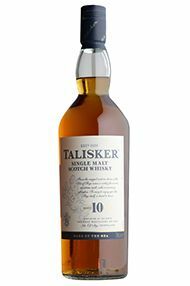 Drawn from 100% American oak refill casks, it has a purity which emphasises Talisker’s unique and intense distillery character. 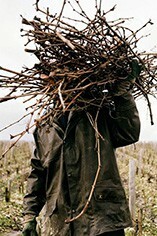 Clean and intense, with light smoke like a struck match. Creamy toffee balanced by fruit. Hints of seaweed, heather blossom and vanilla.